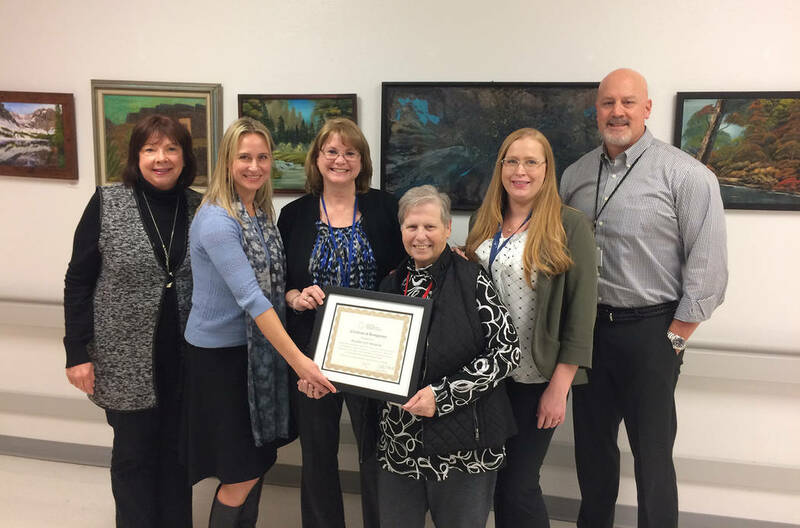 Boulder City Hospital recently received national recognition for using an innovative process to improve patients’ health. (Boulder City Hospital) Proudly showing off their national Critical Access Hospital Recognition certificate for using technology to improve health care are, from left, Peggy Caspar, president of the hospital's board of trustees, Laima Etchegoyhen, outreach and technical assistance coordinator from the University of Nevada, Reno School of Medicine; Arleen Sheeler, risk manager at Boulder City Hospital; Jessica Murray, quality management and infection control at the hospital; Stephanie West, pharmacy manager; and Thomas Maher, hospital CEO. The hospital was recognized by the National Rural Health Resource Center and Nevada Flex Program for using telehealth — utilizing telecommunication technologies for long-distance contact — for its antibiotic stewardship program. It was awarded a Critical Access Hospital Recognition certificate. Arleen Sheeler, a registered nurse and risk manager for the hospital, said they were able to work with educators at the University of Nevada, Reno’s school of medicine to help physicians, staff and the community understand better antibiotic use. According to Sheeler, when antibiotics were first used in the medical industry, it was obvious they were saving lives. But, through the years, their overuse caused the “mean” bacteria that caused infections to get “meaner.” Today, through their stewardship program, they consider whether an antibiotic is necessary and will it be helpful before administering or prescribing it to the patient. Sally Buck, chief executive officer at the rural health resource center, commended Boulder City Hospital for using technology to assist the rural community. “It reflects the innovation required to address unique population health needs in rural communities through expansion of technology,” she said of the award. Facilities in three states were selected to be recognized during this round of nominations, according to Buck. “The Boulder City Hospital team is committed to improving our processes on a daily basis,” said Tom Maher, the hospital CEO. “With the extra work and dedication of Boulder City Hospital Infection Control and Risk Management team Stephanie West (pharmacy), Jessica Murray (infection control) and Arleen Sheeler (risk management) this collaboration became an ongoing successful program,” said Laima Etchegoyhen, outreach and technical assistance coordinator for University of Nevada, Reno School of Medicine.